An 11-year-old was accused of making threats to Walter C. Young Middle School in Pembroke Pines. NBC 6's Amanda Plasencia reports. Pembroke Pines Police were called to Walter C. Young Middle School on Monday after the student made the statement to his first period class. 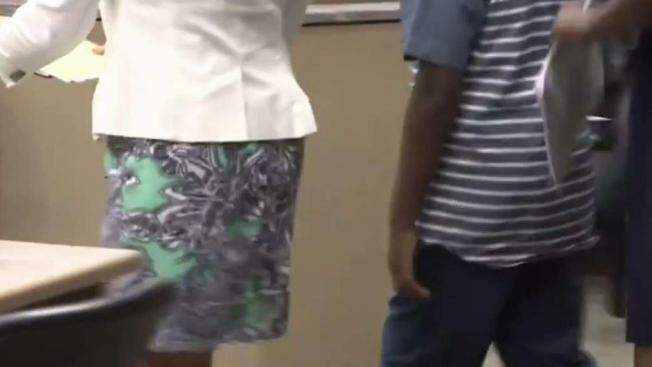 An 11-year-old student is facing felony charges after police say he threatened to “shoot up” his school – the second such incident by a Broward County student in the last two days. Pembroke Pines Police were called to Walter C. Young Middle School on Monday after the student made the statement to his first period class. When another student asked if he was serious, the boy replied “maybe, maybe not” according to a police report. The school’s administration and resource officer were notified and police were called to the school, as was the student’s mother. The student admitted to making the comments and said he knew that he had scared his classmates, adding he was frustrated over his school work. Officials charged the student, who did not have a weapon on him, with a second degree felony. The charge comes one day after a Pines Middle School student admitted to making a similar threat on social media.